When Super Bowl LII kicks off on Sunday at 6:30 p.m. 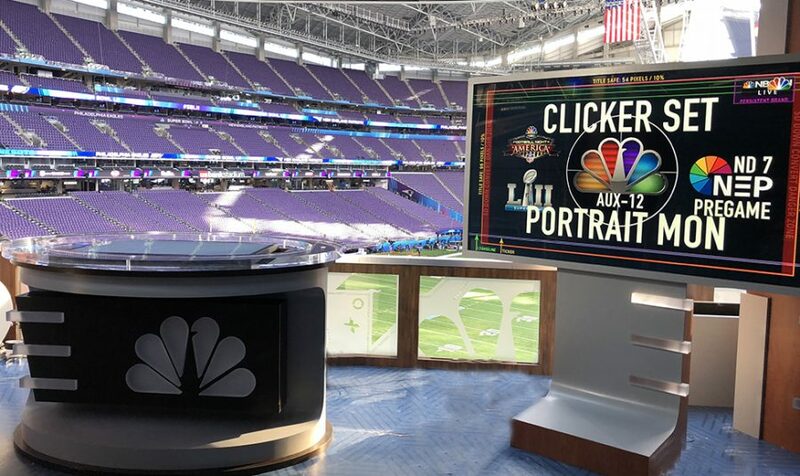 ET, NBC will have already been on the air for more than six hours in Minneapolis and used four state-of-the-art studio sets. And that’s in addition to the Peacock’s weeklong studio presence here, with an array of NBC Sports programs airing live from Nicollet Mall, the Mall of America, and outside U.S. Bank Stadium; also airing from the Twin Cities this week have been Today, The Tonight Show With Jimmy Fallon, NBC Nightly News, CNBC shows, Telemundo Deportes, and a variety of other NBCUniversal properties. NEP’s ND7 mobile unit (A, B, C, and D units) is on hand to serve as the home for NBC’s studio productions onsite. 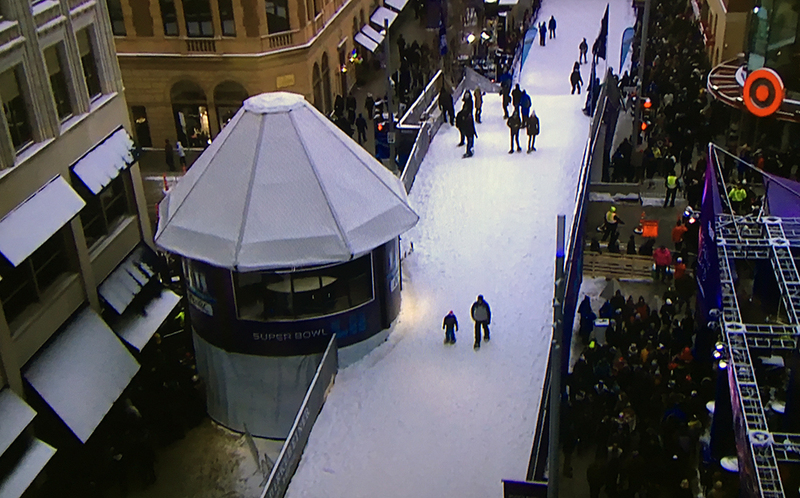 Construction and setup on NBC’s sets inside U.S. Bank Stadium began on Jan. 22, on its Nicollet Mall location Jan. 18. “This is a one-team effort, reflected in the synergy we are seeing both technically and operationally across all our productions,” says Ken Goss, SVP, remote operations & production planning, NBC Sports Group. Dubbed the yurt set, a circular set topped by a 20-ft.-diameter crown is attached to a snow hill at Nicollet Mall in downtown Minneapolis. The snow hill serves as a fan activation with skiing, snowmobiling, and hockey. The set features four cameras, including a jib, and a new desk with a front-mounted monitor. The set has served as the home to NHL on NBC intermission breaks all week and will host Today on Friday and Saturday morning and NBC Nightly News on Saturday night. On Sunday, NBC will open its Super Bowl Pre-Game show at noon from it. “It’s a really amazing set, so we are using it wherever we can,” notes Popple. “When you look at all the shows that are running out of there, we are really getting the bang for the buck. 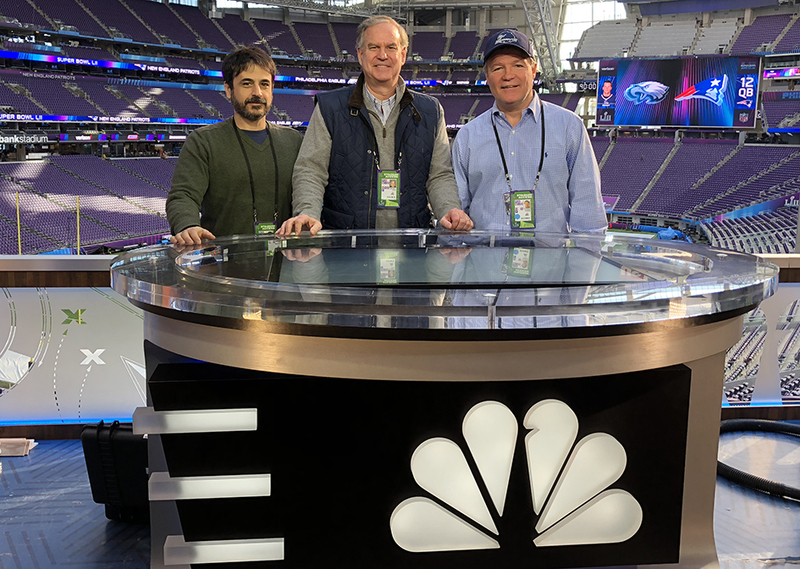 At 1 p.m. on Sunday, NBC Sports pregame coverage will move inside the stadium with two side-by-side sets on the concourse level serving as home to four-plus hours of pregame coverage. The primary 20- x 16-ft. set is outfitted with four cameras, including a jib. It also features the same desk that NBC deployed at Super Bowl XLIX in Phoenix and used all season for its Thursday Night Football coverage but with an LED display in front (instead of the lightbox used on TNF). AG National is providing all the LED displays throughout the set, including the vertical columns, header, and front-of-the-desk displays. NBC Sports has created a “Coach’s Clicker” set next to the main set, where analysts will dissect the game using a touchscreen. Immediately adjacent to the primary set is the Coach’s Clicker set, which features a small desk and a large touchscreen that will allow analysts (including special guest Baltimore Ravens head coach John Harbaugh) to break down specific elements and schemes from the Eagles and Patriots. The set is equipped with two hard cameras and a Steadicam. A small bridge built between the main set and the Coach’s Clicker set will allow talent to move between the two locations without having to reenter the public concourse area. Roughly an hour before game time, Dan Patrick, Tony Dungy, and Rodney Harrison will head down to the field set for On Field Live. This set, the same one used for Sunday Night Football, will have three hard cameras, an RF Steadicam, and an RF handheld. Roughly an hour before game time, NBC Sports Pre-Game coverage will transition to it’s on-field set (pictured here earlier in the week). 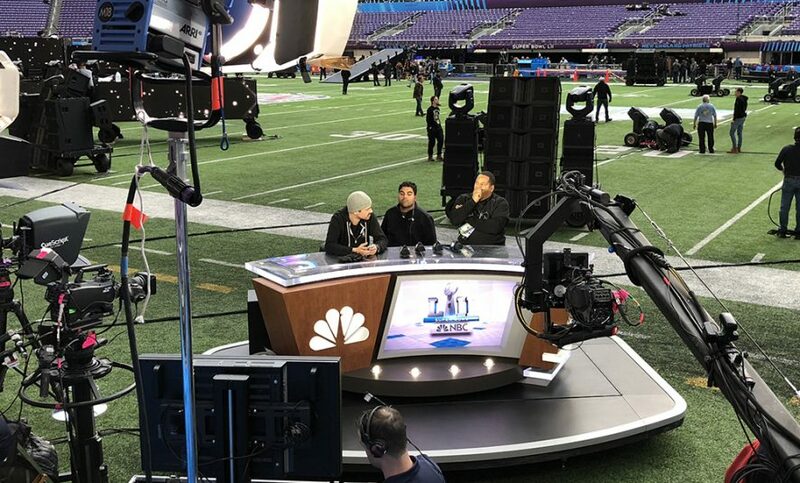 Design and infrastructure for all of NBC’s Super Bowl sets were provided by ISD (Innovative Show Design) with lighting by LDG (The Lighting Design Group). In addition, Saturday Night Live lighting director Geoff Amoral is serving as the lighting director for the interior sets. NBC’s Pre-Game Show will also include live segments and musical performances by Sting and Darius Rucker from the Super Bowl NFL Tailgate Party at the Minneapolis Convention Center. NBC has established a fiber pipe via Centurylink to home-run these feeds to ND7 at U.S. Bank Stadium for integration into the Pre-Game Show. 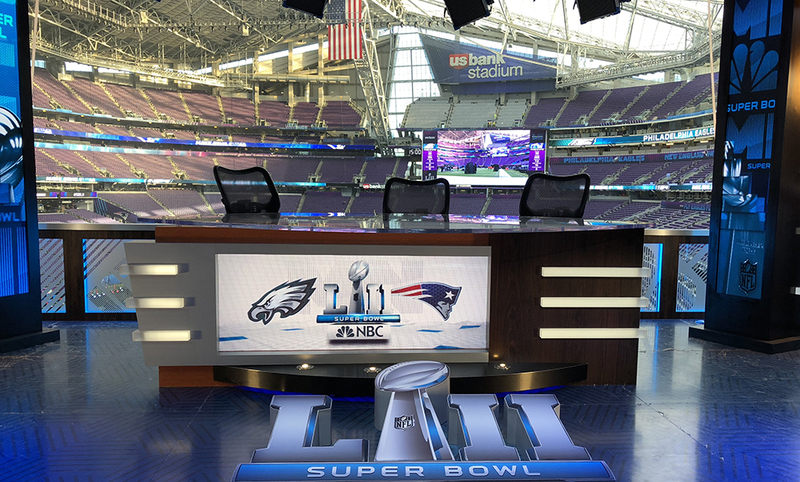 On top of all that, NBC has built a 16- x 16-ft. tent-enclosed set outside U.S. Bank Stadium to be used by NBC Sports Boston and NBC Sports Philadelphia for pregame coverage. The Boston RSN will pretape its pregame coverage from this set, and Philly will produce its live show shortly thereafter. For postgame coverage, Boston will use this set, and Philly will move inside to the Coach’s Clicker set.